I released a video on grain selection and lumber milling on Monday. Check it out! 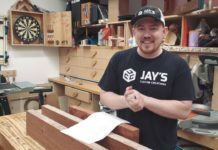 I’ll be attending the City Hardwoods 2nd annual Woodworkers Meetup in Birmingham, Alabama. If you can possibly attend be sure to do so. There will be BBQ and drinks as well as a giveaway from what I’m told. The finish of choice for the cherry dartboard cabinet will be garnet shellac. There will also be some walnut accents that really look great. We’re almost done with the dartboard cabinet and I’m looking forward to seeing the finish applied. This Thursday is Thanksgiving here in the USA. Regardless of where you are take a second to be thankful of the friends and family you have. Be safe and enjoy the holiday. 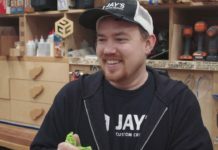 Jay what kind of a drill press are you using? Jay as soon as I saw your shop apron I found the maker on IG and their products look awesome.